Since 2009, the company has supported a revenue-neutral carbon tax is nice; but I think their “support” has been weak. It is their policy, but they don’t push it hard; they don’t campaign for it. 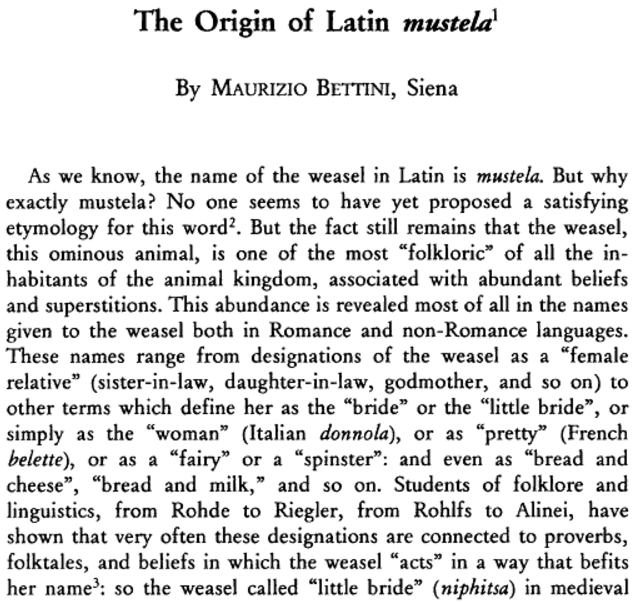 Did you know that “mustela” probably comes from “mus”, which is “mouse”; for theon [telos] in Greek means ‘long’. Most interestingly they have a speech by Tillerson from 2013. They even have a link to the relevant text transcribed: As to our advocacy around a carbon tax—I would not support putting a carbon tax in place today…. Of course, we ought to worry about context, so let’s look. First 30 minutes of the video: intro and speech (heavy on “energy is good for jobs and prosperity and pays lots of taxes” type stuff). Questions at end. Question (man with no tie, you can tell he’s a hippie): GW is one of the great moral questions of our time, but Exxon is notorious for backing denial; yet company website acks that its a critical problem; and back a carbon tax. So, the text of the transcript is very slightly lacking context, but not to any significant degree. He really does say that he wouldn’t support carbon taxes now; he comes close to saying that they put forward carbon taxes because they’d prefer them to cap-n-trade; he’s pretty close to saying only a global carbon tax would suit him. Incidentally, I’m impressed by the sensibleness and seriousness of the session. “little bride” is sweet, and the piece led me to schöntierlein. Which also tells me it comes from “Dér. de bel*; suff. -ette*”, so maybe “small pretty thing” is right. Meanwhile, the etymology of feles is unknown, but maybe “cognate with Welsh bele ‎(“marten”)”. * The EU’s method of dealing with climate change always was insane – Timmy at AS, but also declares the ASI’s undying support for a carbon tax. In Alberta, the oil companies have been supporting the carbon pricing being proposed there. The presumption is that they see the carbon budget being used up and prefer that oil producers get to use it up rather than the coal producers. Steve Coll, the investigative reporter who literally wrote the book on Exxon has suggested that at least the following factors are in play. 1) Carbon tax kills competition from coal before it significantly affects Exxon’s oil/natural gas interests as numerobis suggests above. 2) In the off chance that we get the political will to do something about fossil fuels, they prefer a carbon tax to cap and trade. 3) Coming out in favor of mitigation steps however weakly, gives them plausible deniability should there one day be legal action against those who actively delayed action on climate change. It seems fitting for this news to come out as world leaders gather at the COP21 Paris climate summit. Antimicrobial resistance and greenhouse gases have both increased rapidly because we’ve pursued cheap, fast production whose costs are spread across the globe instead of being paid by those who reap the benefits. Both problems worsen unseen and can only be addressed effectively with large-scale action. In both cases, I hope the repeated alarming discoveries finally prompt the kind of action we need to keep global health and wellbeing from getting substantially worse. See also The Last Flight of Dr. Ain, op. cit. It occurs to me that petroleum is not destined to remain underground, and possibly not coal, either. This depends on the world not ending, however. In other words, is you expect technological civilization to continue, there is and will be a demand for the stuff, just not for burning. All good points. I intended it to be understood that the rates of production would drop drastically. The fate of old plastics is a good question. Is old plastic land-filled truly sequestered? What’s the fate of recycled plastic? Oxidized, effectively sequestered, or recycled yet again? My guess is the industry is far less an impact on greenhouse warming than what goes on now. MarkB’s comment about weak support of a carbon tax as a legal tactic is interesting. I hadn’t thought of it. I think it’s plausible as a secondary motivation. Rex stated his personal inclination of no carbon tax. I’d guess people within Exxon split between those who offer it as a diversion from actually doing something while hoping nothing happens and those who provide weak-tea support as a psychological crutch to convince themselves that they’re not the bad guys in the movie. Exxon was worried that upon Obama’s election that cap-and-trade regulation was going to be passed. Seeing what seemed to be the writing on the wall, namely AGW laws were going to be passed, Exxon was secretly talking to Sierra Club, a heavy-hitting enviro group in the US. Both Exxon and Sierra Club preferred a carbon tax, so they started negotiating to work on capitol hill to replace the proposed cap-and -trade law with a carbon tax. After the AGW bill fizzled, Exxon went back to blocking AGW laws of any kind. I think the ed’s at Bloomberg brought out that story again in light of the efforts of some, like the NY attorney general, to paint a target on Exxon as a symbol of AGW inactivism. Bloomberg is saying look Exxon isn’t so bad. Exxon is becoming a symbol and a convenient target. It’s political theater, and facts don’t count as much as perceptions. [It is a shame; the Greenbiz one is better, without the shadings of conspiracy theory that Bloomberg layers it with. And really do they need If Exxon is serious about climate change, he said, it should endorse a “100 percent clean, energy economy” – its just silly.